While the highlight of Commencement Week at The Ohio State University is receiving a diploma at Ohio Stadium, participating in a “Things You Never Got to See Tour” is a close second. This week, both the graduating and the curious can pay special visits to almost two dozen locations on campus, including limited-opportunity tours of Ohio Stadium, the Schottenstein Center, and the eight miles of the dark, hot underground steam and electric tunnels snaking below more than 100 campus buildings. 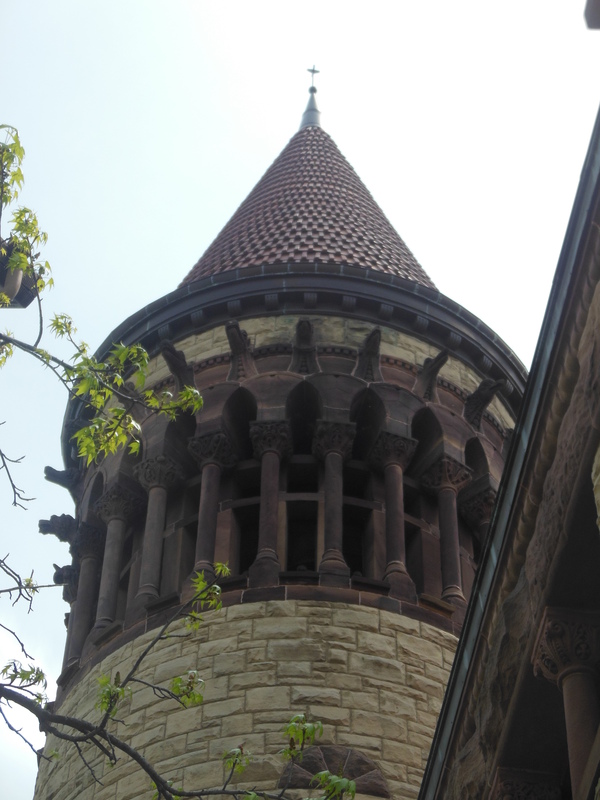 I joined the tour of Orton Hall’s bell tower. and entered a cozy brick-lined room housing the mechanics for the bells. We didn’t get to climb the narrow wooden ladders and squeeze through a tiny opening leading to the upper two tiers of the tower that house the bells. A member of Ohio Staters, Inc., a campus service organization that promotes university traditions, told us about the bells that have chimed across campus for more than a century. 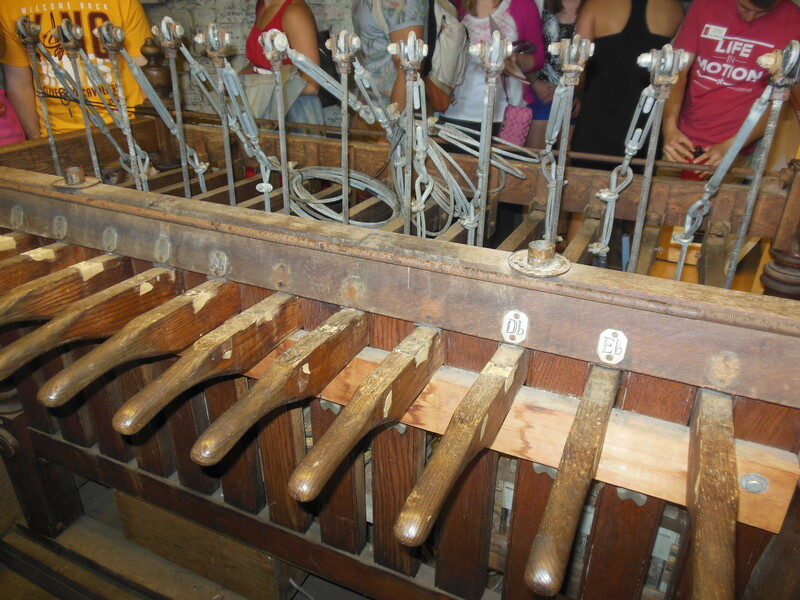 The 14 bells consist of 12 E-flats, an A sharp and a G sharp. The E bells were gifts from the classes of 1906-1914, while the A and G bells were installed in 2003. The original 12 chimes weigh 25,000 pounds. The bells chime every 15 minutes to the tune of the Westminster Chimes. C.W. Reeder, a member of Ohio State’s Class of 1906, transposed several melodies to the Orton Hall chimes. Fred Cornell, a classmate of Reeder’s and the composer of “Carmen Ohio” (Ohio State’s school song), wrote special songs for the bells to play as students moved between classes. Since the reverberation of the bells prevents playing harmonies, songs have to have simple melodies with a limited range of notes. Originally, the bells were played with a chimestand, a series of large, heavy wooden levers that were pulled for each note. 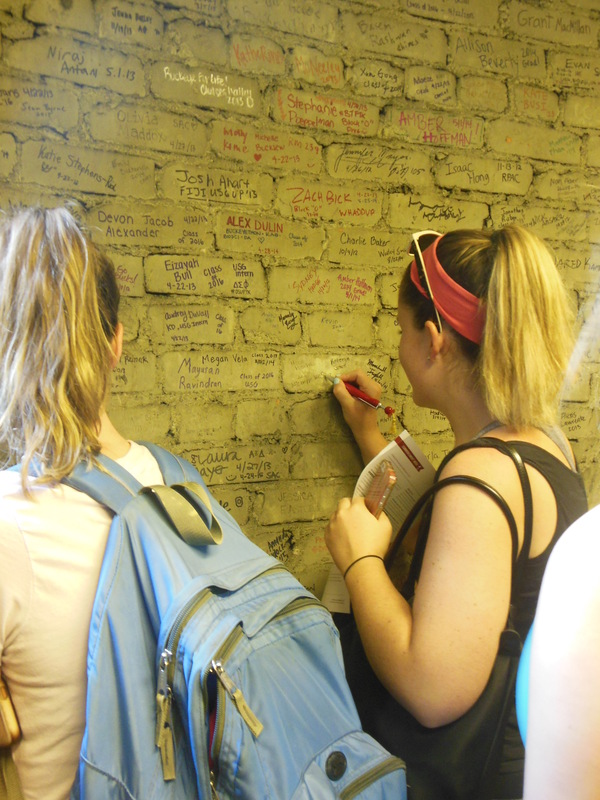 others wrote their names on the tower’s bricks, in keeping with a tradition that dates to the early 1900s. We also learned about this unique building on the Oval and its namesake, Edward Orton, Sr.
Orton Hall was dedicated in 1893, making it the second oldest building on campus. The Columbus architectural firm of Packard and Yost designed the building. Its round arches, bay windows and steeply pitched red clay tile roof are characteristic of the Richardsonian Romanesque architectural style that was popular at the time. All of the stone used to construct the building is from Ohio. The stones are arranged in stratigraphic order, with the oldest limestone rocks at the bottom, progressing to dolomite, and the youngest sandstone at the top. 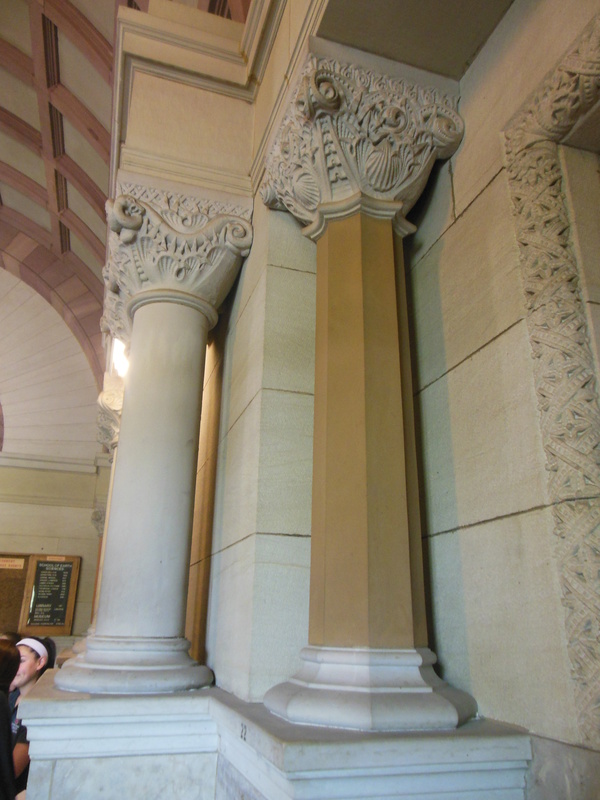 Each column framing the main entry door has hand-carved red sandstone capitals, and each one is different. This one is reputed to be the inspiration for the Block O, the visual identifier of Ohio State. The entry foyer is also constructed entirely from Ohio stone or clay products. It features 24 decorative columns, each from a different variety of Ohio stone which is identified on a sign beside the main entry door. Lintels and capitals are from Berea sandstone, and the hand-carved capitals include medallions of fossils such as trilobites and scallops. 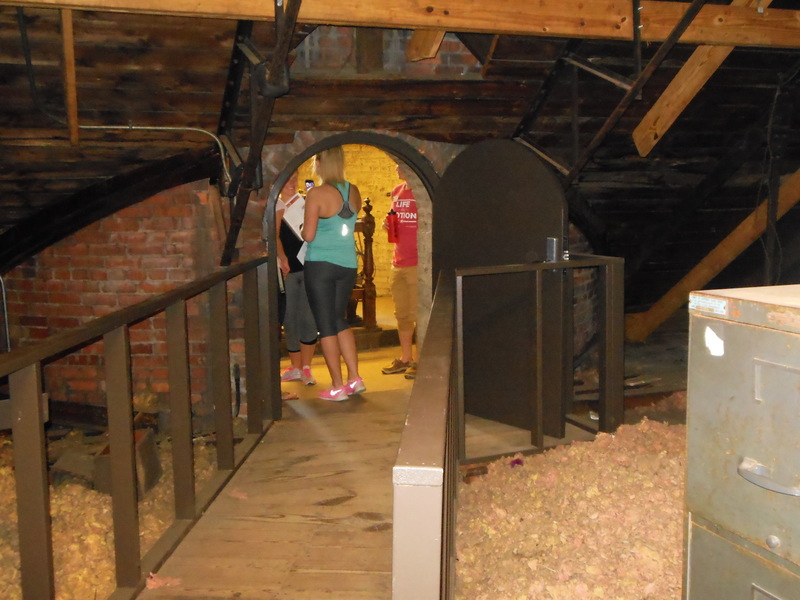 The vaulted ceiling has sandstone ribs, and the floor tiles were made from Ohio clay. 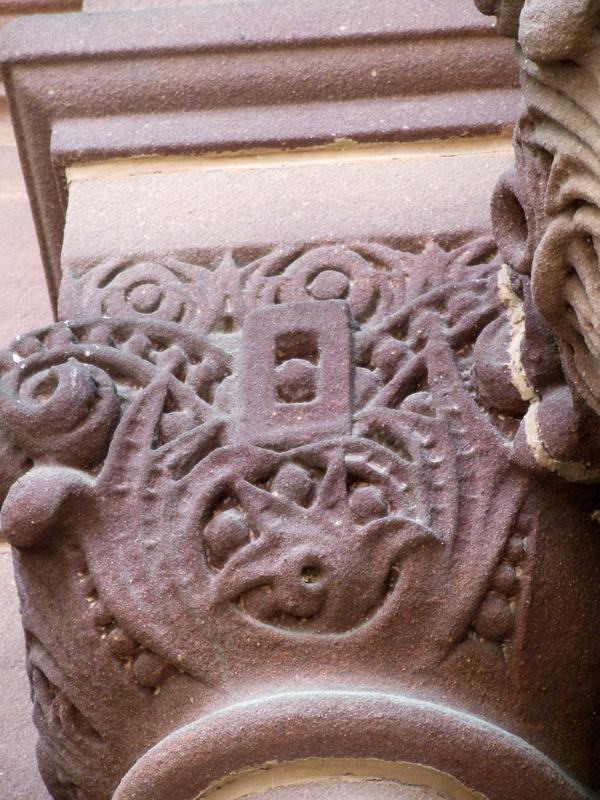 Twenty-four hand-carved Hocking Valley red sandstone gargoyles of extinct creatures circle the top of the bell tower. They represent a different type of prehistoric animal life once found in Ohio, including dinosaurs, ichthyosaurs, pterosaurs and a saber-tooth cat. Edward Orton, Sr. (1829-1899) was Ohio State’s first president, serving from 1873 to 1881. Before he came to Ohio State, he was president of Antioch College. Orton was also a professor of geology at Ohio State from 1873 to 1899, and was the State Geologist of Ohio from 1882 to 1899. This influential geologist is known for his work on the petroleum geology of Ohio, stratigraphy and paleontology. Before the bells were installed, Orton liked to read by lamplight in the tower. 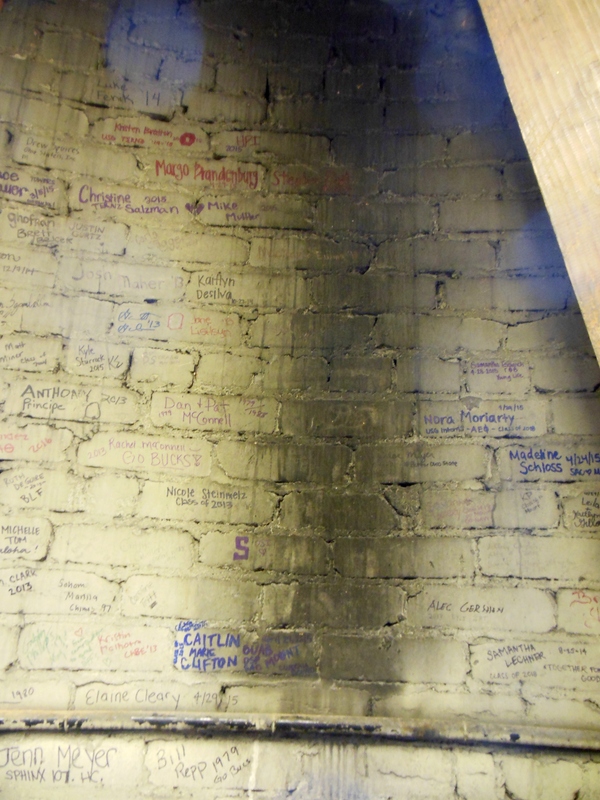 Scorch marks left by his oil lamp are still visible on the tower room walls. Legend has it that Orton’s ghost still haunts the tower, evidenced by a flickering light that occasionally comes through the vertical slots of the turret at night. 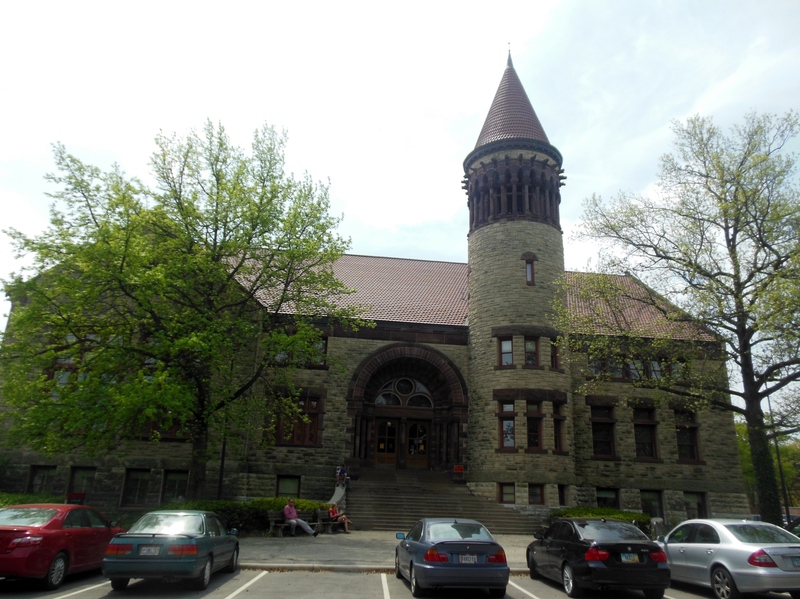 Orton Hall also houses the Orton Geological Museum and the Orton Memorial Library of Geology. 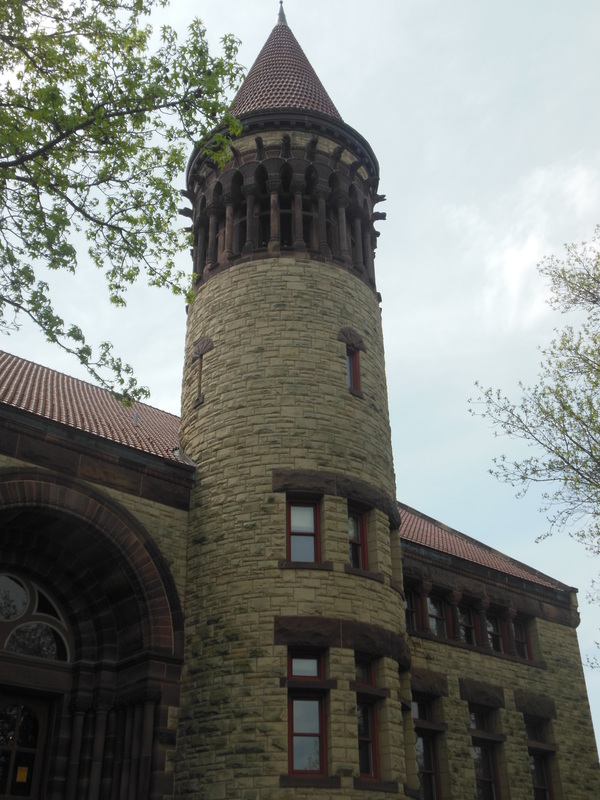 Orton founded the museum in 1893 to house about 10,000 rocks, minerals and fossils from his teaching collection. Today, the collection numbers more than 54,000 specimens from Ohio and around the world. It is open to the public free of charge on Monday through Friday from 8 a.m. to 5 p.m. 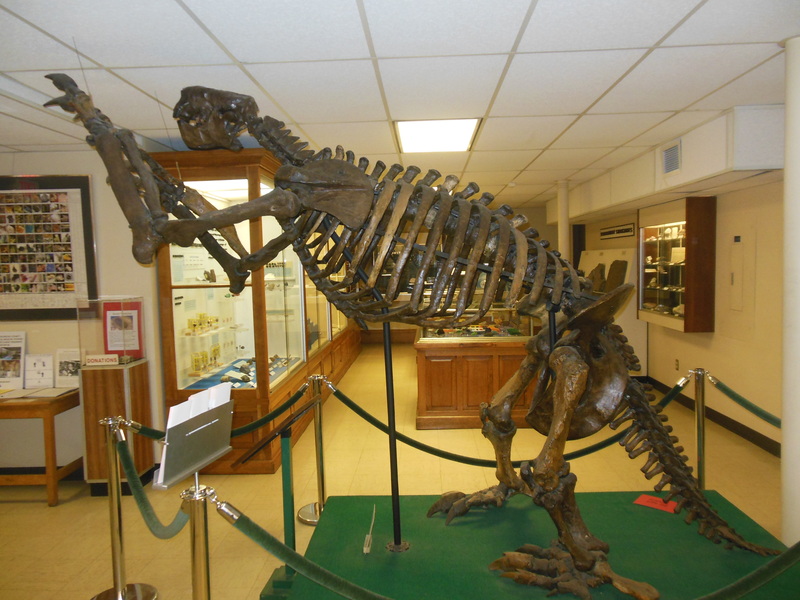 Enter the museum and you’re greeted by “Jeff,” a skeleton of a seven-foot-tall giant ground sloth known as Megalonyx jeffersoni. Megalonyx means “great claw” and jeffersoni refers to President Thomas Jefferson, the first person to bring attention to the species. Giant sloths roamed Ohio two million to 13,000 years ago, during the Pleistocene Epoch. Behind Jeff, you’ll see the skeleton of a 20-foot-long carnivorous fish that lived in Ohio during the Devonian period, when the land was covered by a tropical ocean. The large room on the east side of Orton Hall was the university’s library from 1893 to 1912. 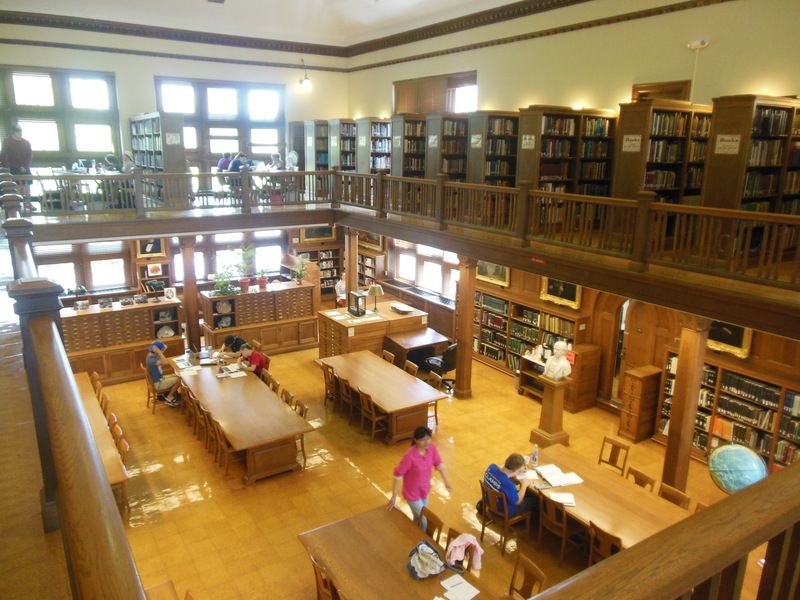 When the William Oxley Thompson Library was completed and the library moved out of Orton Hall, the room was used as a large open space for aerial observation. Students stood in the balcony and looked at models of terrain spread on the floor below. In 1923, the room was renovated to become the geology library, which was established in honor of Orton in 1923. 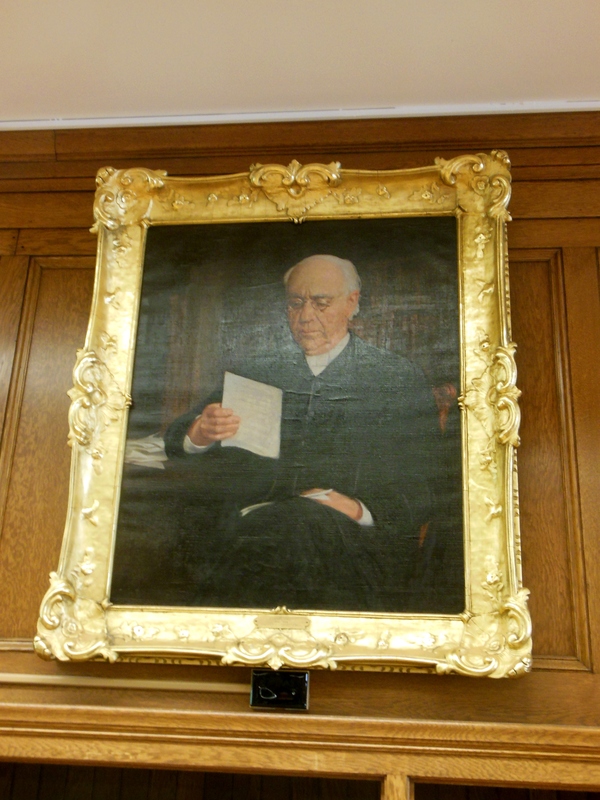 In 1906, Edward Orton, Jr. presented his father’s personal library to the university and the department of geology. Today, the collection includes over 120,000 volumes of books and series relevant to various aspects of geology and related subjects, including meteorology, mineralogy, paleontology, polar studies, pollution and soils. 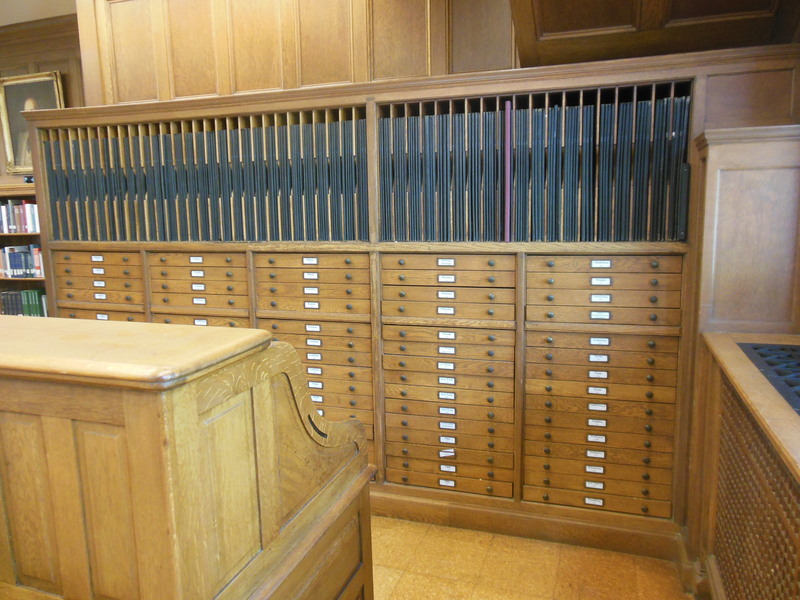 Countless maps are stored in dozens of drawers. 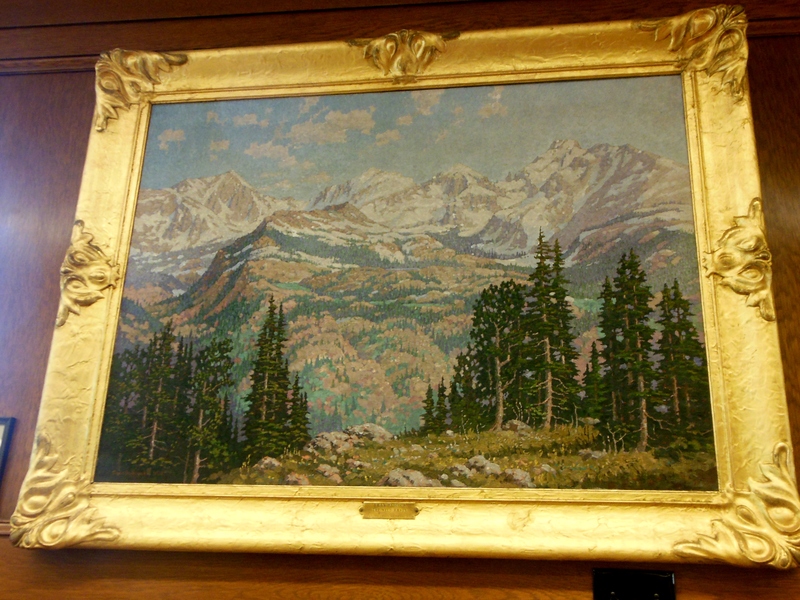 The artwork in the library was part of the personal collection of Orton, Jr., who was professor of ceramics at Ohio State from 1894 to 1916; Dean of the College of Engineering from 1902 to 1908 and from 1910 to 1916; and Ohio State Geologist from 1899 to 1906. 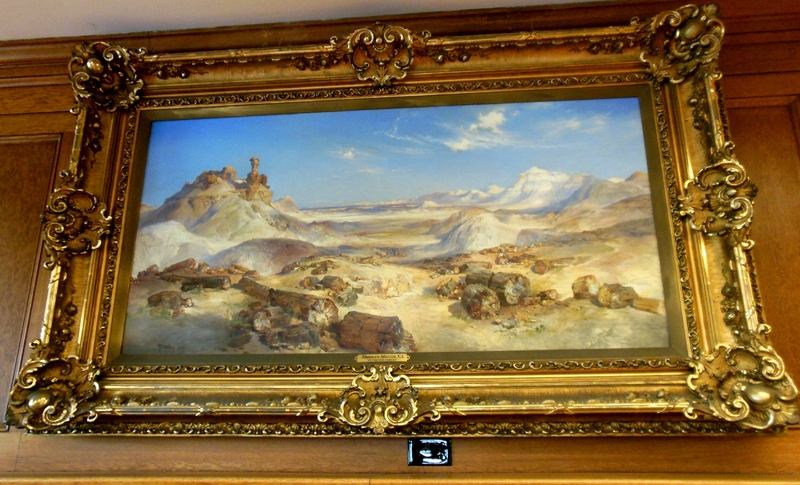 Petrified Forest was painted in 1904 by Thomas Moran, a noted Hudson River School painter. Orton, Jr. acquired the painting in 1925 because he liked how it illustrated the geological process by which fossils are preserved. 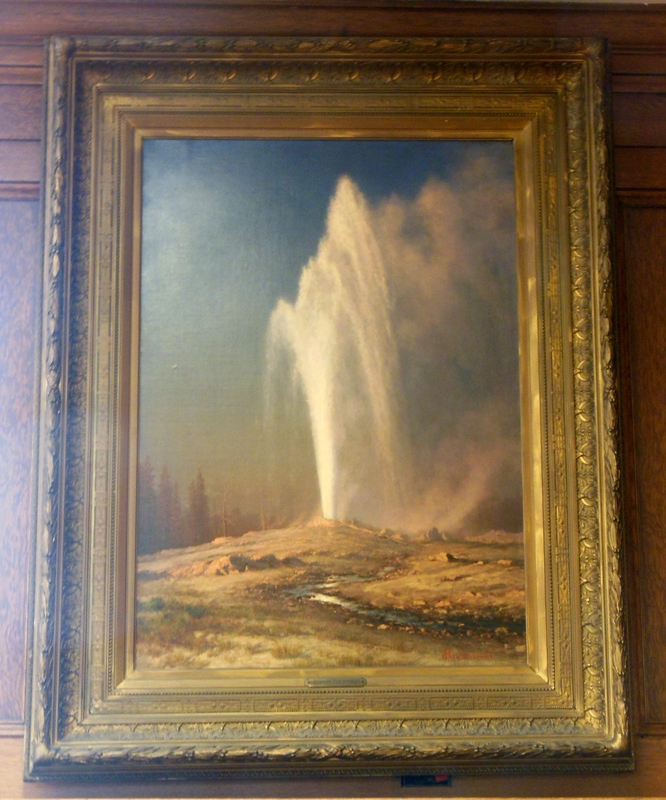 Paintings by Albert Bierstadt, a painter best known for his landscapes of the American West, include Yellowstone Geyser, Yellowstone National Park (1886) and Quartzite Peak in the Canadian Rockies (1890). Other paintings represent Bryce Canyon National Park, a Swiss mountain valley, the eruption of Mount Vesuvius, and Mt. Orton in Rocky Mountain National Park, Colorado, which was named for Orton, Jr., who climbed the mountain with other faculty members from Ohio State’s Department of Geology. 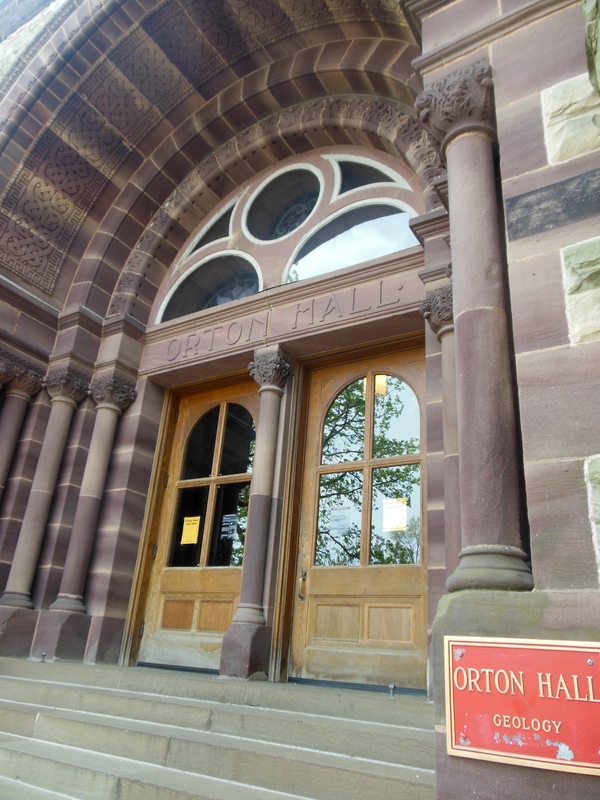 Click here to see the Orton Hall bells, hear them play and see how small the tower room is in “The Chimes of Orton Hall,” which aired on the February 4, 2015 episode of WOSU’s Broad and High. This entry was posted in Architecture, Art, History, Music, Ohio State University. Bookmark the permalink. Back in the 1970s the door was left unlocked and students could go up anytime to see the Quasimodo du jour at work, slapping the levers on the chimestand. He could lock down the levers that weren’t used on a particular song to get them out of the way. 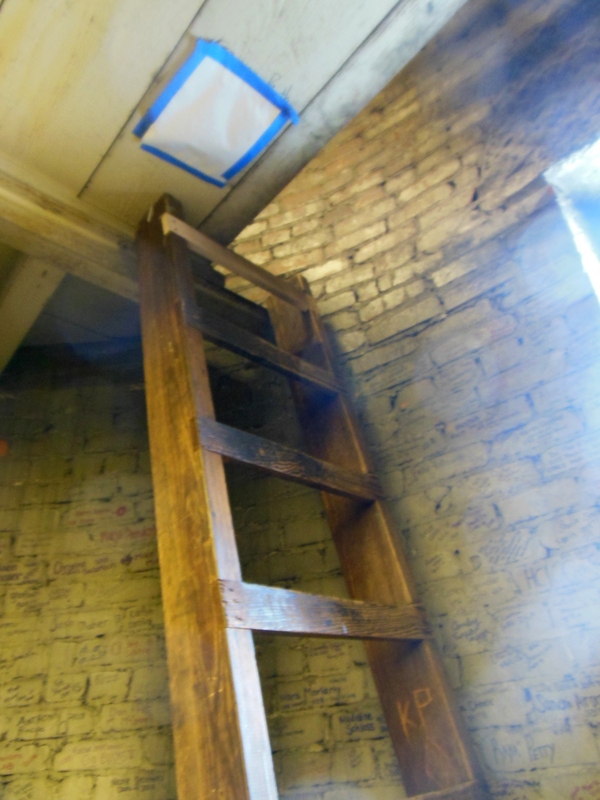 We could also go up the ladder to stick our heads through the trapdoor to see the bells. On a Christmas house tour in Marietta I got to see a similar arrangement of bells in the tower of the Congregational church. 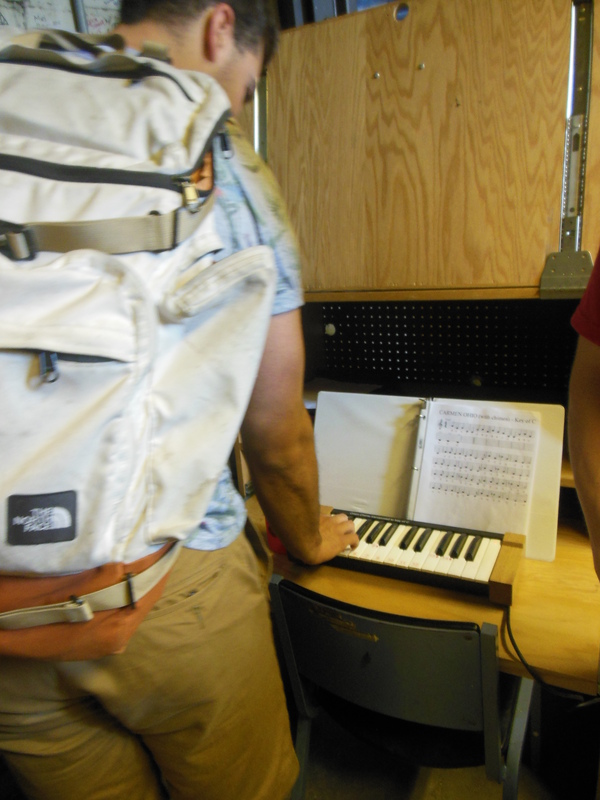 Replacing the mechanical chimestand with an electronic keyboard just doesn’t seem right.